These economical KXPD Paper Roll Dispensers are a handy way to neatly & efficiently dispensing a wide range of Kraft & recycled Kraft papers. Supplied with a Heavy Duty Cutting edge and Front Tension Bar for clean cutting, this product will not only keep your packing station tidy, but reduce waste from torn or ripped paper, and speed up production. 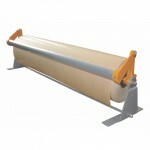 At Defendapack we carry a range of 4 different widths to accommodate most paper sizes.